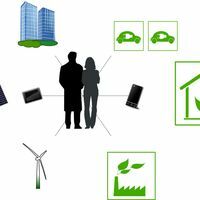 The future of energy is locally generated, locally owned, low carbon and smart. The development of smart energy technologies provides the potential to change the way households, businesses and communities generate and consume energy. Energy storage and management technologies will help to balance energy generation and consumption on a more local scale. This will help increase the percentage of our energy that can be generated from variable and local renewable sources and better manage our electricity networks. The energy industry is already changing with new supply companies beginning to challenge the ‘big six’ and commercial models emerging that enable small consumers and generators to become active participants in the energy market.